Bless your home and those who will next dwell in it with our St. Joseph Home Sale Kits. A St. Joseph Statue is the perfect way to invoke the blessings of Joseph the Worker for those who wish to sell a house, or find a new one. Our Saint Joseph Home Selling Kits bring generous favors to those who keep such objects in or around their house. 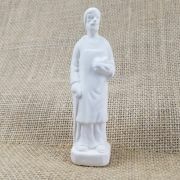 Each kit includes a prayer card and a statue of the patron saint to display in your home. St. Joseph Realtor Home Sale Kit - Buy 12 and save! St. Joseph Realtor Home Sale Kit - Buy 24 and save!